Functional B-1 cells derived from mouse embryonic stem cells are capable of long-term engraftment and secrete natural antibodies after transplantation in mice, researchers report February 7th in the journal Stem Cell Reports. Scientists are interested in B-1 cells generated from pluripotent stem cells because they could be tested as a therapeutic for a broad range of immunological disorders. "It is still challenging to produce transplantable immune cells from mouse embryonic stem cells, so obtaining transplantable functional B-1 cells from mouse embryonic stem cells is a significant advance in the field," says senior study author Momoko Yoshimoto of the Center for Stem Cell & Regenerative Medicine at the McGovern Medical School at UTHealth in Houston. "The take-home message is that a portion of immune cells may be replaced by cell therapies utilizing pluripotent stem cells in the future." Hematopoietic stem cells in the adult bone marrow—the soft, sponge-like tissue in the center of most bones—provide various blood cells throughout life. Hematopoietic stem cell transplants are now routinely used to treat patients with cancers and other disorders of the blood and immune systems. But with current in vitro methods, it is challenging to produce hematopoietic stem cells that recapitulate the properties of cells in living organisms without gene manipulation. In particular, bone marrow transplantation may fail to reconstitute some immune cells called B-1 cells, which produce immunoglobulin M (IgM) antibodies—the first type of antibody the immune system makes to fight a new infection. In addition to patients who receive stem cell transplants, IgM deficiency also occurs in individuals with some cancers, autoimmune diseases, allergic diseases, and gastrointestinal diseases, increasing the risk for life-threatening infections. 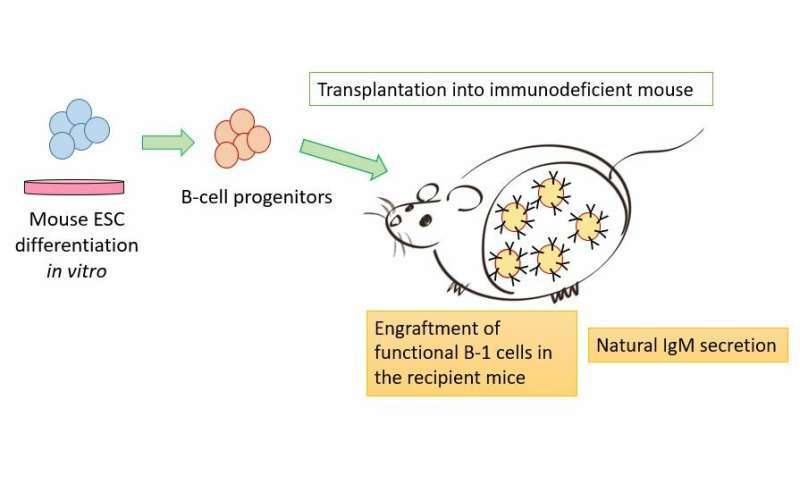 In the new study, Yoshimoto and her colleagues demonstrated that functional, transplantable B-1 cells can be generated from mouse embryonic stem cells without gene modifications. The researchers overcame previous barriers preventing this feat by using high-quality cell lines to support B cell development. After being transplanted into recipient mice, stem cell-derived B progenitors matured into B-1 cells that were maintained for more than 6 months and secreted natural IgM antibodies. "Producing functional B-1 progenitors in vitro from mouse embryonic stem cells is an important step to develop a cell therapy to provide natural IgM and innate B-1 cells that may not be provided by bone marrow transplantation," Yoshimoto says. In future studies, the researchers will attempt to generate B cells from human induced pluripotent stem cells, which may be used for cell therapy to treat patients with immunological disorders. "This is just a first step in a long process to translate our findings to humans," Yoshimoto says.